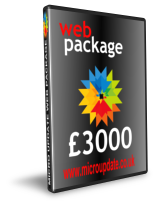 All our websites and strategies are priced individually to customers requirements, but this shows a rough price guide for web development with Mobile and Social Networking. There are a multitude of variables within this and we can only give an accurate quote after we have had a chat with you and documented all your requirements. All our websites are designed specifically to suit your requirements. After our initial meeting and requirements gathering we will design a content management system that reflects your business objectives for your web presence. This may be a two page website or a website with multi-region / multi-language and eCommerce. We provide packages and pricing to suite your exact requirements. You may already have a preference for your website hosting. Many customers already have a website and are looking to re-design and update it with new features and social networking. We can provide either Windows or Linux hosted websites - the choice is always yours. Your website will come as standard with MySQL database access and full FTP - so you can get to your data, when you want to. You will always be able to access your data and run your complete website if you want to. As standard we will backup your website and the software on a regular basis giving you piece of mind that your data will never be lost. All our web solutions come as standard with both POP3 and IMAP email accounts plus an online webmail system if you would like to get your email via the cloud. The setting up of these accounts is completely free and can be integrated into your existing email systems such as Microsoft Outlook and Gmail if required. We will register a domain name or setup up your existing domain name to work from your new website - we take all the hassle so you do not have to worry about sorting out DNS records or other technical aspects of your website. Your domain name is registered for 2 years and included with all out packages. Anti-Virus is always running at the server - so before any email or data gets to your systems it is already virus checked by leading anti-virus software to offer you complete piece of mind that your systems are safe. All our systems come as standard with a CMS (Content Management System). What does this mean for you? It gives you the complete control over your website once we have finished designing and deploying on the web. Your content, images and even layout can be changed by your business if you want to - at any time - via the web. If you do not have the time to do this we can offer to maintain your content for you for a small monthly fee so you can get on with running your business. Being found on the search engines is important to your business to ensure that you are seen by your potential and existing customers. 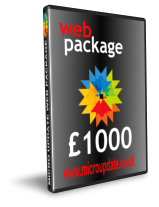 All Micro Update's websites are optimised for the search engines. This is a process that continues throughout the life of your website as content is added. Don't forget we offer a FREE editorial check of all content that you put onto your website. Contact us for details (07976 946 060) or click here to find out more about our SEO solutions. In order to see how your website is performing against your businesses objectives you will need a comprehensive analytics package. Analytics of your clicks and website activity is standard on all out web design packages so that you can see how your campaigns are running and build up monthly statistics and metrics to optimise your website. We will also add Google Analytics to your website to give you more information about your websites performance. If you decide to run AdWord campaigns in the future we will integrate the analytics so that you can monitor your campaigns performance as the campaign runs. Your siite will be backed up regularly as standard. We will either store the backups for you at our site, or we will email / FTP them automatically to you as soon as they are ready. This will give you complete peace of mind to know that your website and content / images are completely safe. Some of our packages offer eCommerce as standard so you can sell products and services online. eCommerce can always be added to any package at any time if required. SSL (extra Internet security) can also be added to give you customers complete confidence that they are buying products and services from a reputable business. All our packages come with FREE telephone support 9am - 5pm Monday to Friday and 9am - 1pm Saturday. We are technical and passionate about our solutions and will always get back to you in a quick and polite manner.